The chart above shows the clan Xāmōrte and its relations with other clans. 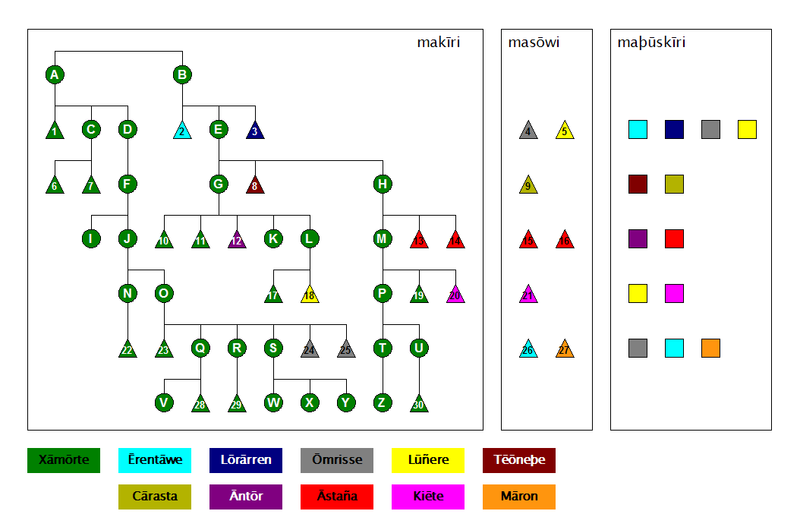 The first box, labeled makīri, shows seven generations of the clan. This chart shows formal descent and membership in the clan as opposed to actual genetic descent. Females are green circles lettered A-Z, and males are triangles, numbered 1-30. The triangles that are green are those males that stayed in the clan and never married out. Triangles 2, 3, 8, 12, 13, 14, 18, 20, 24, & 25 are males who were born into the clan but later married out. The color of the triangle corresponds to the color code for the clan they married into. The males in the second box, labeled masōwi, are males from other clans who married into clan Xāmōrte. Marriage into a clan is not between one man and one woman, it is between a man (or men) and the whole generation in that clan that they are marrying. Any children in the next generation are legally related to the man's clan, regardless of any genetic relationship. Children can have multiple clan relations through their father(s). So, the children of the third generation (starting with male #6 to female H) are related to both clan Ōmrisse and clan Lūñere. Through their uncles (mawēsi) who married out, they are also related to clans Ērentāwe and Lōrārren. The people in the clans one is related to by marriage are one's maþūskīri (third box). One's maþūskīri depend on which generation one is born into. The third generation has maþūskīri in clans Ōmrisse, Lūñere, Ērentāwe, and Lōrārren through the previous generation; to clans Tēōneþe and Cārasta in their own generation; and to clans Āntōr and Āstaña through the following generation. They are not related to clans Kiēte or Māron. matiē: Females J, K, L, & M are I's matīji and vice versa. makāe: Males 10, 11, 12, 13 & 14 are I's makāji and vice versa. macūma (makīra): Males 15 & 16 are I's macūmi makīri or simply macūmi. I is their macēna (makīra). ancūma and ancēna mean 'male' and 'female'. maxāntie: This chart does not depict any maxāntie for I. Though I could very likely be maxāntie with J.
mapāra: Females F, G, & H are I's mapāri. I is their malāca. mawēsa: Males 6, 7, & 8 are I's mawēsi. I is their malāca. masōwa: Male 9 is I's mawēsi. I is his malāca. mārjanen: Females A, B, C, D, & E are all I's mārjanni. I is their mēlīña. mawēsaron: Males 1, 2, & 3 are all I's mawēsaroni. I is their mēlīña. malāca: Females N, O, & P are I's malāci. I is their mapāra. mamōīñ: Males 17, 18, 19, & 20 are I's mamōīñi. I is their mapāra. Male 21 is also mamōīñ by marraige/adoption. mēlīña: The entire sixth generation (male #22 through female U) are I's mēlīñi. I is their mārjanen. Males 26 & 27 are also I's mēlīñi by marriage/adoption. mapāranen: Females of the third generation in clans Tēōneþe, Cārasta, Āntōr, and Āstaña are I's mapāranni. Females of the first and second generation in clans Tēōneþe & Cārasta are also considered mapāranni. I is their makāñīñ. masōwaron: Males of the third generation in clans Tēōneþe, Cārasta, Āntōr, and Āstaña are I's masōwaroni. Males of the first and second generation in clans Tēōneþe & Cārasta are also considered masōwaroni. I is their makāñīñ. makāña: All members of the fourth generation in clans Tēōneþe, Cārasta, Āntōr, & Āstaña, are I's makāñi and vice versa. makāñīñ: All members of the fifth generation in clans Āntōr, Āstaña, Lūñere, and Kiēte are I's makāñīñi. I is their mapāranen.